Berat, in Albania, is one of the world’s oldest inhabited cities. It is also known as the ‘town of one thousand windows’ and is a beautiful example of a well preserved Ottoman town. The best places to stay in Berat are a stones throw from the town centre allowing you to soak in the magical atmosphere of this special city. Berat sits on the right bank of the river Osum and divides into three parts; Kalaja - on the castle hill, Mangalam - at the foot of castle hill and Korica - on the left bank of the river. The city was given World Heritage Status in 2008 partly due to its wealth of beautiful buildings of architectural and historical interest. The topography is equally impressive with the Timorri mountains providing a suitably grand backdrop. There is much to see and do with many byzantine churches, mosques dating from 1417, the ancient castle whose origins go back to the fourth century BC!, museums etc. For more active types there are great river walks, horse riding on Korica hill and river rafting on the Osum. Berat Castle, the remains of a grand 13th-century fortress. 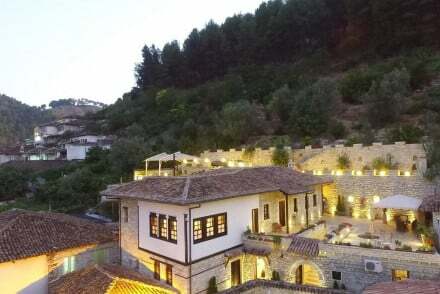 The Gurus pick for the best place to stay in Berat is a charming townhouse hotel just ten minutes walk from the old fortress. Hotel Vila Aleksander is an authentic Albanian hideaway which is a ten minute walk from the old fortress. A nineteenth century townhouse, it has been lovingly restored - all original features and traditional furnishings. It has two terraces with magnificent views and represents great value for money - doubles start from as little as €35 per night including breakfast! An authentic Albanian hideaway situated 10 minutes walk from the old fortress of Berat. This attractive 19th century townhouse has been carefully restored and rooms boast plenty of original features and traditional furnshings. The perfect base for experiencing local culture, and superb value. Less £ - With rooms from just €35 per night including breakfast, it offers fantastic value for money.